Don’t know what system to use for your filing and you’re feeling confused? Don’t know what to keep or where to start and that’s making you anxious. And you don’t have a process so new paperwork comes in and sits in a pile on the kitchen bench!? Ok, let’s nip all this in the bud! the types of documents you need to keep. Take a look, it really is helpful! An earlier blog of mine “Take control of your snail mail box” outlines a number of simple ways to stop paperwork from coming into the house in the first place. This includes unsubscribing to things you don’t get a chance to read, receiving bank statements via email and the same with utility bills. Reducing the amount of paper that comes into the house makes filing so much easier. You can do this either by the name of the thing that you are filing like “electricity”, or by the name of the provider like “United Energy”. This is totally up to you. Try using a home manual or important files folder. Kikki k has a collection of great ones including Bills Organiser and the pictured Manuals and AMP. 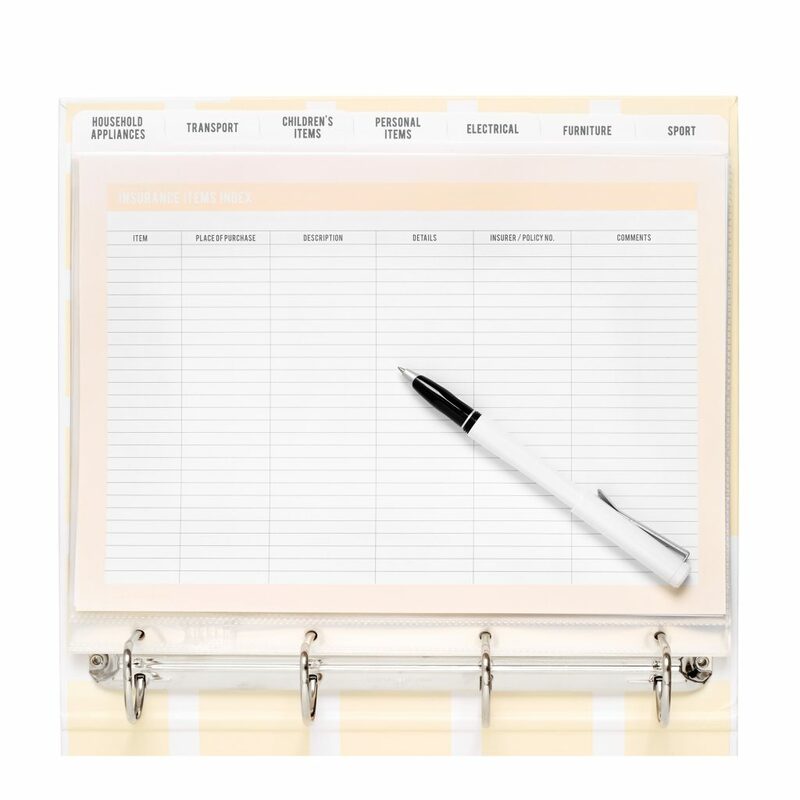 These folders will give you some set sections to store your important items. This is a great way to be able to quickly reference things that you need. As mentioned earlier, perhaps you don’t need a paper copy. Save copies of important documents electronically in the similar alphabetise filing system on your computer or somewhere in the cloud. However, that being said, you may not even need the electronic copy, if you need the information you can contact the provider to access your information. Now I must admit I have been criticised for saying that you can just file your paperwork in a box. The criticiser was right; retrieving information from a box is difficult. BUT, I have worked in homes where paperwork is all over the home. Keeping 2017/2018 in a box, would make retrieval much easier than searching in the office, and the kitchen and bathroom (yes, the bathroom), where all the files are in no date order at all! 5, 10, 15 years worth of paperwork all over the house. My point with the idea of using a box, is that the system does not need to be complicated. It just needs to be easy to use so you can continue to use it. If you’re a visual person, you might find the colour coded system works for you (as pictured in the title image). In this system, each broad category is given a colour eg: utility bills, warranties and manuals, school, financial, etc. This makes returning files to their permanent home in the filing cabinet easy. Choose colours that remind you of that category. Which system above will best suit your needs? 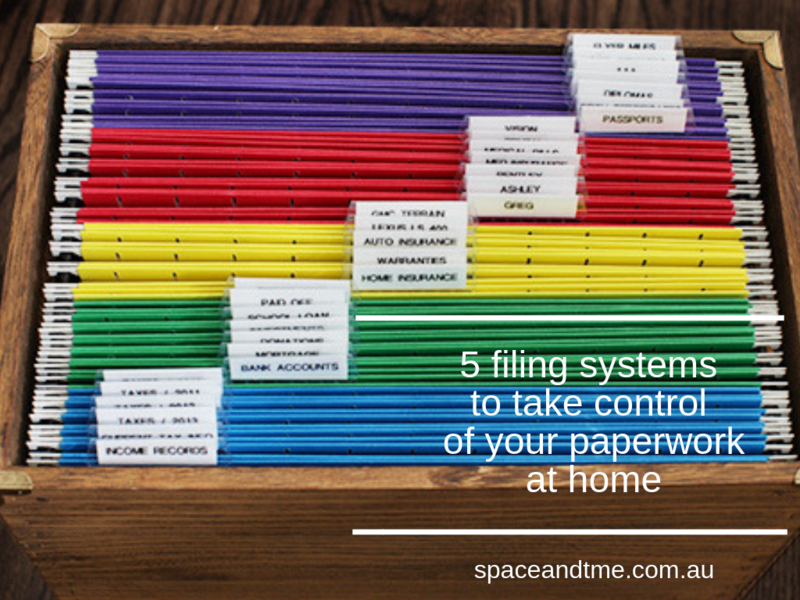 Can you reduce the amount of paperwork coming into the house in the first place and once you have processed the paperwork, do you need to keep it at all? Of course the crucial part of managing paperwork is to process regularly as outlined in Take control of your paperwork. Make it a part of your weekly routine. If you really can’t get your head around all this, give me a call to discuss your challenges. I’d be happy to give you some guidance. If you’re you’re still stuck after a chat, I can come and work in your home and sort it all out for you. ← What paperwork do you need to keep at home? Thanks to everyone that responded to the question on my personal FB page "what 3 things would you like to have more organised at home?" One response I received was "keeping up with the laundry!" The biggest mistake I see in people’s homes in relation to the laundry is unfolded washing. "Timed myself folding the washing from the line last night – and it only took 5 minutes! and 5 minutes to put away! so seriously there’s no excuse 🙂 "
What a great win for her! No more piles of washing on the couch. Need some more help? Check out this blog I wrote about kids’ keeping their room organised, which includes teaching them to figure out if their clothes need washing or not.